The United Kingdom is a consolidated democracy, in which core civic freedoms of peaceful assembly, free speech, and associational life are guaranteed by law, and generally respected and upheld in practice. Three environmental protestors were released after an appeals court overturned their custodial sentence for public nuisance. On 17th October 2018, three anti-fracking protesters, Richard Roberts, Simon Roscoe and Rich Loizou, were released from custody, having earlier been sentenced to up to 16 months in jail for "causing a public nuisance" during a four-day protest in front of a fracking site in Lancashire in July 2017. The three environmental activists had climbed onto lorry cabs and refused to vacate them, thus blocking the work at the site and impeding the flow of traffic. The sentence was described by three appeal court judges as “manifestly excessive”, as the three protestors received messages of solidarity from all over the country. Over 200 academics signed a letter urging a judicial review stating that the sentencing “set a dangerous precedent”. The sentences were replaced with conditional discharges. The judge who ruled for jailing the three protesters is also the subject of a parliamentary investigation into possible political motives behind the harsh sentence. "Today's decision affirms that when people peacefully break the law out of a moral obligation to prevent things such as the fossil fuel industry they should not be sent to prison. Fracking is beginning right now, so there has never been a more crucial moment to take action. Your planet needs you. We encourage everyone who is able to join us this Saturday for a mass demonstration at the UK's first fracking site and to look up the activist network Reclaim the Power and find opportunity to take direct action or to volunteer in vital support roles." “These are desperate attempts to impose a polluting industry on a public who do not want it. When the government and corporations show such disregard for people and the planet, taking direct action like yesterday’s blockade is a moral obligation”. 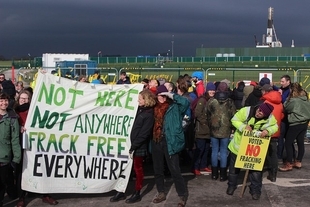 After the protesters were jailed, the group Reclaim the Power started a petition calling for an inquiry into the space for civil society to oppose fracking. According to the group, “increasingly severe outcomes and restrictions” have been imposed on their activism. The government also changed regulations concerning exploratory drilling in order to restrict the community oversight of the matter. In less than a month, the Reclaim the Power petition attracted almost 29,000 signatures. As previously reported by the CIVICUS Monitor, a number of injunctions have been sought by the industry against protestors. Moreover, the policing of protests has involved the use of force, including on vulnerable people taking part in the demonstrations. Activist groups claim that these measures are deliberately aimed at discouraging people from taking part in protests against fracking. According to the data from a Yorkshire law firm, between September 2017 and March 2018, out of 85 arrests outside Third Energy’ site in Northern Yorkshire, only 41 resulted in convictions. “It’s not surprising to see such a low conviction rate. Arrests at protests are often made to remove individuals from the area. I was arrested four times, which allowed the police to convince the judge I posed a threat of re-offending. So he banned me from the entire Habton Road which leads to the fracking site. All charges against me were later dropped, but the police managed to keep me away from the protest for nine months”. Anti-fracking activism continues, with fifty protestors opposing fracking firm Caudrilla during a demonstration at its Lancashire site on 15th October 2018. A number of arrests were made. The strategy “includes public funding, private investment, buildings, and other spaces for a community to use. It also includes trust and goodwill, and the organisations and partnerships that bring people together”. The strategy received a mixed reaction from civil society. Social Enterprise UK’s Andrew O’Brien praised the "bold ambition" of the strategy, which also aims at engaging the private sector in the discussion. Nevertheless, he stresses that the plan remains "vague", "leaving a lot to follow up". The United Kingdom is bound by the European Convention on Human Rights (ECHR), as enshrined in domestic law, which guarantees the right to freedom of association. The United Kingdom is bound by the European Convention on Human Rights (ECHR), as enshrined in domestic law, which guarantees the right to freedom of association. Whilst civil society organisations, NGOs, and other types of associations are generally free to operate without hindrance or state interference, the United Nations Special Rapporteur on the rights to freedom of peaceful assembly and of association, along with other NGOs, have voiced recent concern about an incremental and subtle erosion of the UK government’s respect for civic freedoms. Specific concerns focus on the government’s counterterrorism strategies involving broad definitions of extremism, which may include legitimate associations and activities. The UN Special Rapporteur voiced particular concern at the broad definition that the state uses for “domestic extremism”, and the government’s ‘Prevent’ strategy, nominally aimed at countering ‘non-violent’ extremism. Following a 2016 official visit to the UK, the UN Special Rapporteur decried ‘Prevent’ as resulting in “crude racial, ideological, cultural and religious profiling, with consequent effects on the right to freedom of association of some groups”. The right to peaceful assembly is guaranteed under domestic, regional, and international human rights standards. The right to peaceful assembly is guaranteed under domestic, regional, and international human rights standards. Public demonstrations are a routine part of public life. Police forces in the UK periodically employ violent tactics against protestors, including containment or ‘kettling’ tactics which may undermine the right to freedom of peaceful assembly. There is an ongoing public enquiry into the use of undercover policing tactics to infiltrate and exert control over assemblies and protest movements, which the UN Special Rapporteur on the rights to freedom of peaceful assembly and of association has described as “not justifiable”. Freedom of expression, including freedom of the press, is guaranteed and protected under domestic laws, and regional and international human rights standards. Freedom of expression, including freedom of the press, is guaranteed and protected under domestic laws, and regional and international human rights standards. A planned Counter-Extremism and Safeguarding Bill (currently receiving legislative scrutiny for its human rights implications) has the potential to make it harder for 'people of all faiths and ideologies to express their beliefs and opinions’, undermining the right to freedom of expression.